CoolSculpting® is a non-surgical, FDA-cleared treatment used to eliminate stubborn fat safely and effectively without surgery or downtime. Controlled cooling safely targets and eliminates diet- and exercise-resistant fat in such areas as the abdomen, hips, flanks, thighs, banana roll, bra fat, upper arm, and submental area. Freeze away fat? It comes down to a science. Fat cells freeze at higher temperatures than surrounding tissues. CoolSculpting® technology safely delivers precisely controlled cooling to gently and effectively target fat cells underneath the skin. The treated fat cells are crystallized (frozen) and then they die. Over time, your body naturally processes the fat and eliminates these dead cells, leaving a more sculpting you! It’s easy to sit back, relax, and say goodbye to stubborn fat. After we select the area(s) to be treated, the device is positioned on your body with a vacuum-like suction and controlled-cooling applicator is applied. This treatment can take 35 to 65 minutes per applicator. During the procedure, you may choose to read, check email, or even take a nap. The CoolSculpting® fat freezing procedure is completely non-surgical, so you can typically return to work and normal activities immediately. You will like what you see! In the weeks and months following your CoolSculpting® procedure, your body naturally processes the fat and eliminates these dead cells. Once the treated fat cells are gone, they’re gone for good. Results will appear as inches lost from the treated area over the course of the next few weeks while the body metabolizes the dead fat cells. This natural process continues for about four to six months. Each CoolSculpting® treatment plan is customized to your body transformation and addresses your problem areas. Additional sessions may further enhance your results. Your individualized treatment plan will be tailored to your body, your goals, and your budget. The most commonly treated area with CoolSculpting® is the lower abdomen. Women especially enjoy inches lost from their stubborn “lower pooch” that may have developed from pregnancy, weight gain, or aging. Men also choose this area for reduced abdominal fat and a firmer contour. CoolSculpting® can treat the inner or outer thighs so that patients can look great in jeans, tighter pants, leggings, skirts, and swimwear. Sculpting this area can also eliminate chafing or discomfort caused by excess fat in the thighs. Whether your “double chin” is genetic or the result of excess weight, removing fat from the neck and beneath the chin with CoolSculpting® can have a tremendous effect on your appearance. With the jawline defined, patients can look up to five years younger and several pounds lighter. Many patients complain of “bra fat” or bulges of fat on the back that seem impossible to remove with diet and exercise. CoolSculpting® will smooth the area to create more aesthetically pleasing posterior contours. The flanks, also known as “love handles,” are a common problem area, especially for men. Even a minimal amount of reduced inches in this area can provide a satisfying result in both appearance and comfort. 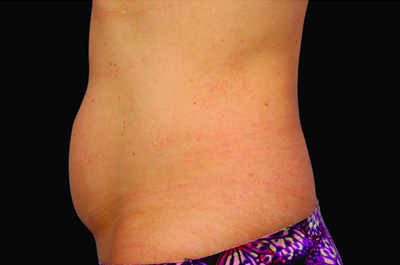 The effectiveness of CoolSculpting® varies from patient to patient. Many patients see up to half an inch of reduction in the treated area right after the treatment, while others do not see noticeable results for several weeks. Most patients can lose up to three inches in the treated area. The cost of CoolSculpting® will depend on several factors, including the areas treated, the number of treatment sessions needed, and the patient’s individual goals. We will provide the customized treatment plan that fits your unique goals, anatomy, and budget. Temporary side effects may include numbness, redness, swelling, bruising, firmness, tingling, stinging, and pain at the treatment site. More serious side effects are rare. Patients will feel pressure and intense cold toward the beginning of the treatment. Deep pulling, tugging, pinching, or numbness may also occur, which is normal and temporary. Best Doctor I could of chosen!!! Its taken me 15yrs to pull this trigger and when I did I couldn't of chosen anyone better. As nervous as I was the staff made me feel comfortable 100%, then when I got to meet Dr. Mabourakh it was even better. He wasn't pushy, very honest and extremely helpful in helping me get the look I've wanted all these years. I can honestly say, I'm extremely happy with how everything turned out and I look fantastic just like he promised me! Candidates for CoolSculpting® have noticeable bulges of fat that are resistant to diet and exercise. While CoolSculpting® is not a weight-loss procedure, it is an effective non-surgical alternative to liposuction. Those who experience the best results are within 30 pounds of a healthy weight for their height. CoolSculpting® is FDA cleared for the treatment of stubborn fat. Over one million CoolSculpting® procedures have been performed worldwide, and it is recognized as a safe and effective treatment for non-surgical fat reduction. Yes. Since CoolSculpting® is completely non-surgical, there is no recovery time; patients can return to normal activities immediately. Many patients even return to work right after their treatment. What happens if I gain weight sometime after treatment? If patients gain weight after treatment, it may be apparent in the treated area, but it will be less noticeable than it would have been without CoolSculpting® treatment.